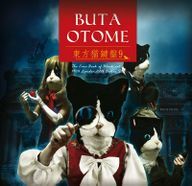 Touhou Keyboard Cat 9 (東方猫鍵盤9, Touhou Nekokenban 9) is a doujin album by BUTAOTOME released on 2014-08-16 (Comiket 86). It features instrumental arrangements of themes from Embodiment of Scarlet Devil, Perfect Cherry Blossom, Immaterial and Missing Power, Imperishable Night, Shoot the Bullet, Mountain of Faith, Subterranean Animism, Undefined Fantastic Object, Touhou Hisoutensoku and Fairy Wars. It is the ninth fully instrumental piano arrangement album by パプリカ, and includes re-arrangements of previous BUTAOTOME tracks. It is sequel to Touhou Keyboard Cat 8. This page was last edited on 21 December 2016, at 21:18.